Bulb replacement seems like a simple problem, but the kicker for me, and from reading the forums, for many others, is finding the flasher. Is it on the left of the steering column or the right? Is it Blue as one post mentions or some other color? Well I did the research, I spent the time, but sill couldn’t find it. With the LED installed, it flashes continuously making it easy to locate. Once we did this all my time on research and searching under the dash was waste of time. I have a 99 ranger. Apparently the earlier models have a blue flasher. Mine is yellow. 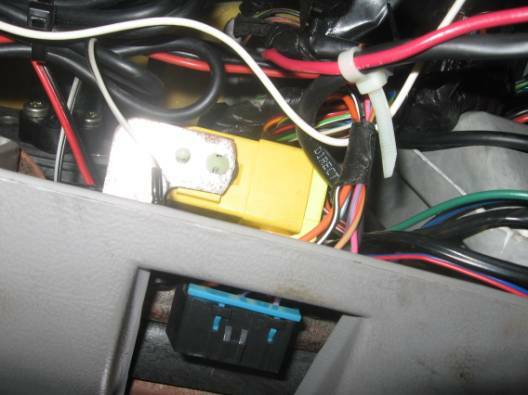 It is mounted on a slide mount directly over the OBDII Port. Put your finger behind the left side of the flasher and push, it will slide off the bracket. In this picture, it is free from the bracket. Lift the retaining clip and pull the flasher off the socket. I show this picture so you can see the pin numbers and the retaining stud at the bottom. I wanted the replacement flasher to be in the yellow case. I put the yellow flasher in a vice so that the end opposite the pins was in the jaws with the stud side up against the jaw on one side. A little gentle pressure, spreads the sides, with the retaining dogs, open just enough so that a pair of needle nose pliers pulling on pin 4, the center pin, will pull the relay out of the case. Now take the cover off the new EP27 relay, set the new cover aside. 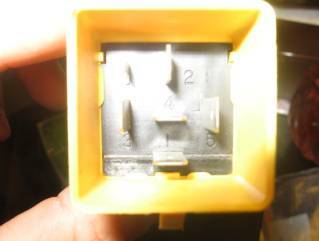 Now, slide new relay guts into the old yellow case. Make sure that the two adjacent parallel pins, 1 and 4, are on the retaining stud side. Don’t be concerned about the fact that the old relay has six pins and the new EP28 only has five. The small sixth pin has no lug in the socket hole for that pin. It is not connected to any thing. Some points about bulb replacement. These are the bulbs I replaced. Since these are LEDs (light Emitting Diodes) diode, being the operative word, they only pass current in one direction. So you may find after you insert a bulb it doesn’t work. Remove it , rotate 180 degrees and reinsert it. Now it should work. Leave the front and rear turn signals for last. Test each bulb as you go, before you replace the covers. Do the front turn signals first. You can test bulb polarity using the front parking lamps. Make sure you use the 3157s. The 3156s are for the rear. Put the rear 3156s in last. You will have to install the new flasher to test these. After you install the new flasher and the 3156s in the rear, and before you put the covers on, try the left and then right turn signals or use the four-way hazard. The front should be fine since you tested them with the parking light on. If one of the rear turn signals fails, remove it, rotate it 180 degrees and reinstall it. If everything is ok , you can put the covers on. 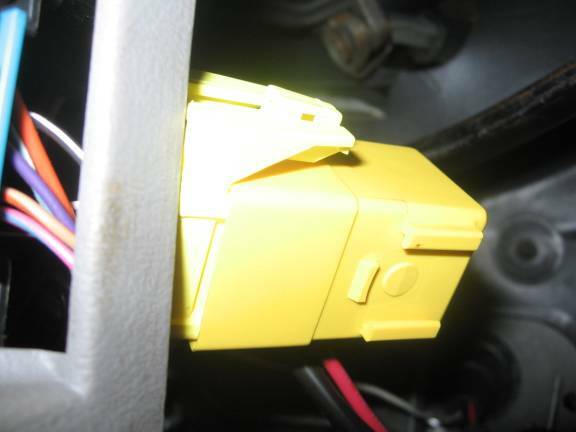 If you use your vehicle for towing, you may have problems with the LED flasher.